Heyne's crotalaria is an undershrub up to 40 cm tall, with hairless branchlets and simple elliptic-lanceshaped leaves. Leaves pointed tip, margin entire, base wedge-shaped, membranous, hairless. Flowers are whitish blue, in racemes up to 5 cm long, at the end branches. Sepals are 5, up to 1 cm long. 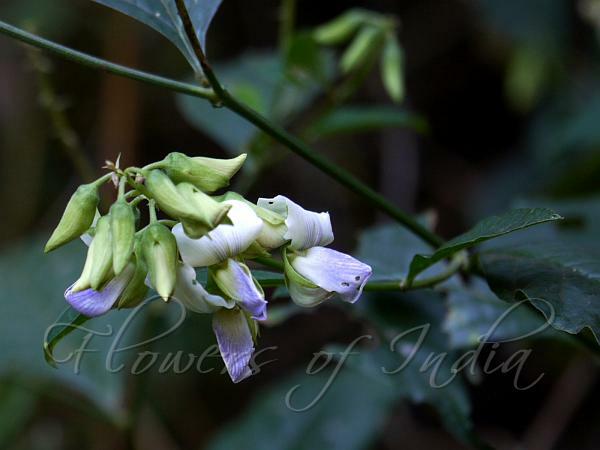 Flowers are shaped like pea-flowers, with white standard and blue wings. Wings equal calyx or are slightly longer. Seed-pod is oblong, 10 seeded. 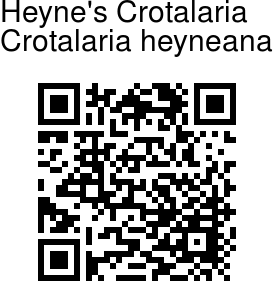 Heyne's crotalaria is found in S and SW India. Photographed at Yana Rocks, Karnataka.